Slaying of Spaniards in the West fjords in 1615 - a conference and an exhibition 24th – 25th of June 2006 The Snjafjallasetur Heritage Centre had a conference and an exhibition in Dalbaer on the 24th and 25th of June in cooperation with the project West fjords in the middle ages, Strandagaldur and the West fjords Nature Centre on the slaying of Spanish whalers. After the conference there was a program of entertainment. Steindór Andersen will chanted the socalled “Viking-rhymes”, written by an unknown author about the slaying of the Spaniards, and Elfar Logi Hannesson offered a theatrical piece based on the writings of Jón Gudmundsson the learned about the slaying of the Spaniards. Spanish or Basque whalers were shipwrecked in the West fjords in 1614. When, in the spring of 1615, the Spaniards took a ship they were accused of robbery and were killed by farmers led by regional governor Ari Magnússon in Oegur. The Danish King had condemned them to death by cause of robbery and illegal trade, but they were never brought to court of any kind. Jón Gudmundsson, called "the learned", wrote a book on the slaying of the Spaniards, shortly after those events. Between the Basques and the Icelanders a special trade language, "lingua franca" was developed. Recently, archeologists have discovered the remains of a spanish whale station in Steingrímsfjordur. On the picture there are organisers and lecturers at the conference in Dalbear. 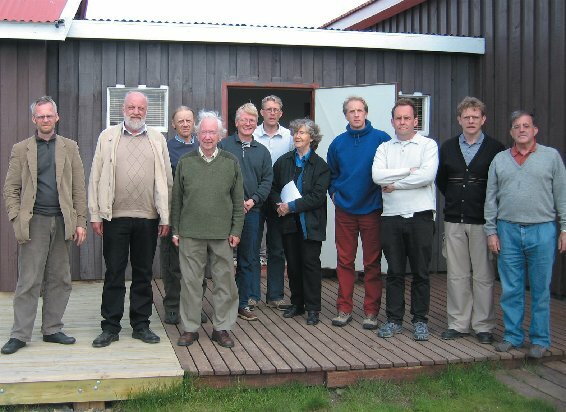 From left to right: Ólafur J. Engilbertsson, manager of Snjafjallasetur; Jón Thór, chairman in Isafjordur historic society; Magnús Rafnsson, who had a lecture on Jon “the learned” and archeological discoveries; Jónas Kristjánsson, who had a lecture on the edition of Jon “the learned” manuscript; Torfi Tulinius, who had a lecture on whether the slaying of the Spaniards was a massacre; Már Jónsson, who had a lecture on the sheriff Ari in Oegur and his two verdicts on the Spaniards; Selma Huxley, who had a lecture on Martin de Villafranca; Michael Barkham, who had a lecture on Basque whalers in Newfoundland and Spitzbergen just before 1600; Trausti Einarsson, who had a lecture on Basque whaling near Iceland; Sigurdur Sigursveinsson, who had a lecture on the events on a cronological basis and Henrike Knörr, who had a lecture on the special trade language, known as “lingua franca”.